I have been having so much fun lately with a bunch of new cookbooks, like this one from America’s Test Kitchen, called “Vegan for Everybody.” I was fortunate enough to hear Jack Bishop, ATK’s Editor and Chief Creative Officer, present this book at my local bookstore, Pages. I am fascinated by testing recipes and making the subtle tweaks towards perfection. There’s no one in this space who does it more rigorously or better than America’s Test Kitchen. You may have seen me write about their new vegan cookbook on a recent Five Friday Favorites, but I finally found the recipe I want to share with you. 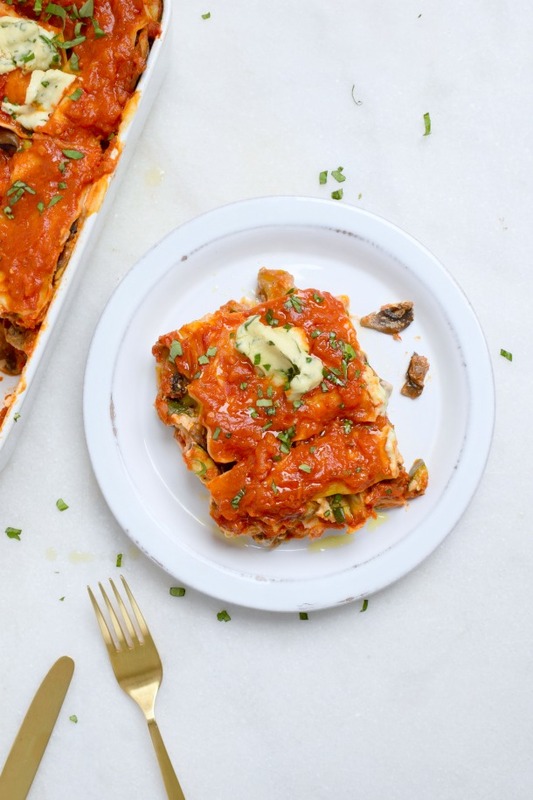 This Hearty Vegetable (and vegan) Lasagna is as good, if not better, than any lasagna I’ve had with meat or cheese for that matter. 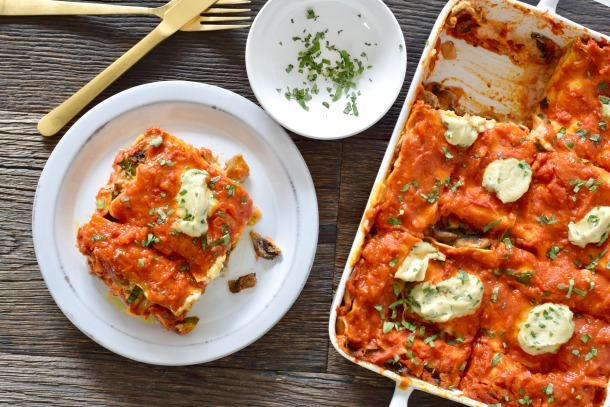 Lasagna is a favorite comfort food, but it can be very heavy and hard to digest. I personally am not a fan of a super cheesy, meat-filled dish, so I had a feeling I would be smitten with this recipe. Basically, this what makes this lasagna vegan is the lack of any dairy products. But just because a dish is vegan doesn’t necessarily imply nutritious (you could eat a vegan potato chip and Tofutti popsicle diet, for example.) But before you assume that ATK subbed in some pasty, tofu ricotta and a processed non-dairy cheese that doesn’t really melt, think again. 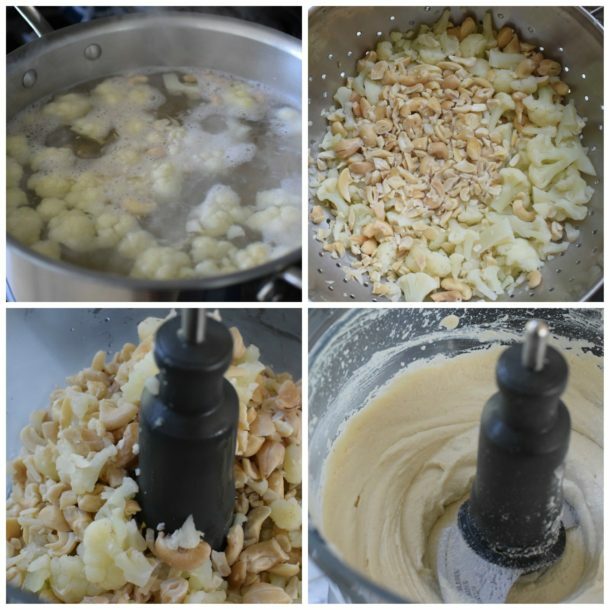 They actually did the work and came up with a genius puree of boiled raw cashews, cauliflower, olive oil and water. 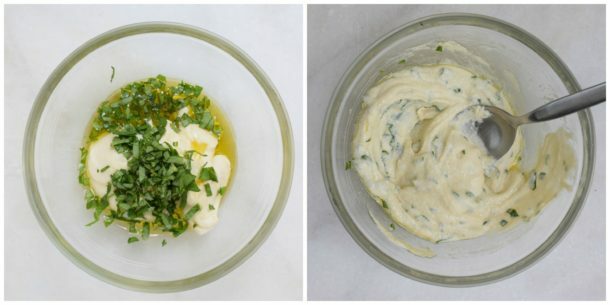 The result is an ethereally light “ricotta” that rivals the real thing. Once again, I ask “is there anything cauliflower cannot do?” A bonus is that this filling contains high quality protein so you don’t have to worry about adding any to complete the meal. 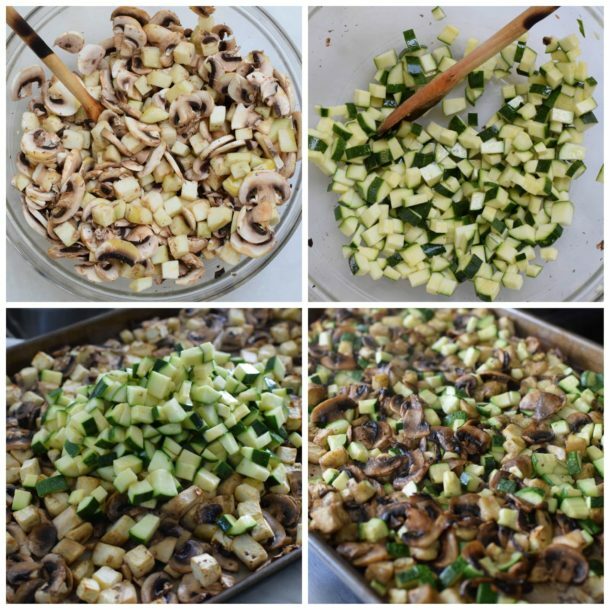 Eggplant, mushrooms and zucchini are included for great flavor and substance. I imagine sautéed dark green leafy vegetables like Swiss chard would also be nice here. 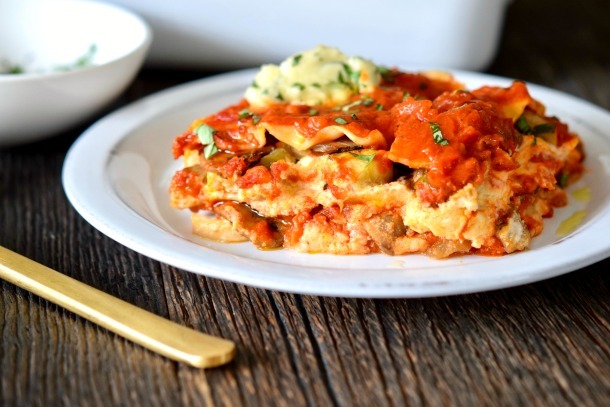 And gluten-free lasagna noodles are easy to find, so this can be made gluten-free and vegan. Is it your lucky day, or what? The true test came when I served this lasagna to my family. Mr. Picky actually tried it because he doesn’t eat cheese, so this was “safe” and he really liked it. My husband lives for a traditional lasagna, and he apologized for rolling his eyes when I told him this was vegan. He loved it! 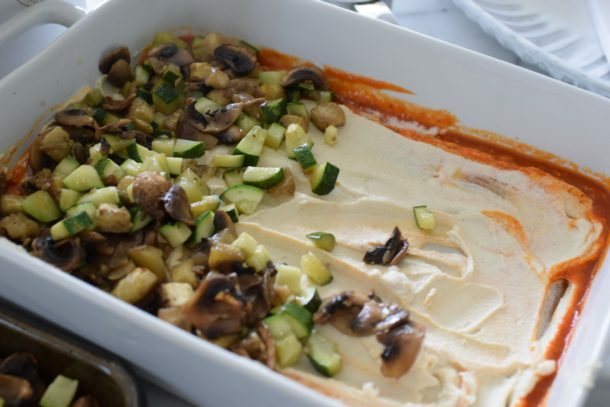 This lasagna proved that a good vegan recipe can be had with a balance of flavors, textures and substance. I can’t wait to try more recipes from this book. Stay tuned! For the filling: Bring 3 quarts water to boil in a large saucepan. Add cauliflower florets, cashews, and 2 teaspoons salt and cook until cauliflower is very soft and falls apart easily when poked with fork, about 20 minutes. Drain cauliflower mixture in colander and let cool slightly, about 5 minutes. For the lasagne: Adjust oven rack to middle position and heat oven to 375 degrees. Grease 13 by 9-inch baking dish. Spread 11/3 cups tomato sauce over bottom of dish. Arrange 4 noodles on top. Spread half the cauliflower filling over noodles, followed by half of vegetables. Spread 11/3 cups tomato sauce over vegetables. Repeat layering with 4 noodles, remaining cauliflower filling, and remaining vegetables. Arrange remaining 4 noodles on top, and cover completely with remaining tomato sauce. Cover dish with aluminum foil and bake until edges are bubbling, 45 to 50 minutes, rotating dish halfway through baking. Dollop lasagne evenly with 8 to 10 spoonfuls of reserves cauliflower topping, and let cool for 25 minutes. Drizzle with oil, sprinkle with remaining 1 Tablespoon basil, and serve. I made this with my homemade marinara sauce, but I included the recipe from ATK. Or use your favorite brand. I doubled the cashew and cauliflower and didn’t end up using it all. Any recommendations for storing/what else to use it for? You can use it as a base for roasted vegetables like carrots + some toasted hazelnuts and herbs. Or on toast with savory toppings like sautéed mushrooms. I don’t know if you eat eggs, but you can likely combine it with beaten eggs and sautéed veggies and bake like a frittata. I love making this lasagna. We are trying very hard to go plant based I haven’t bought or made lasagna with meat sauce in 10 years, this is by far the best recipe I ever introduced my family to. Everything about this site is a YES! Thanks, Kellie! I agree about this lasagna. It is a staple for us, especially with my vegan hubby. This was amazing! And just like traditional lasagna, even better the next day!!! Thanks for sharing the recipe! So glad you enjoyed it! I have eaten this cold out of the fridge the next day and thought it was still terrific. Hi can you freeze this and how long does it last in fridge? Yes, you can freeze it. It lasts up to 5 days in the fridge after baking. Can I freeze this dish before I bake it? Then put in oven directly out of freezer? Can frozen cauli be subbed and if so what changes in timing would you make? Also if jovial gf says you can make without pre cooking or you can par cook would you try no cook? Last time I did par. Have you done gf without par boiling? I don’t see why you couldn’t use frozen cauliflower. Start the cashews in water and after 10 minutes add the cauliflower and boil for another 10 minutes. If the jovial box says you can make without pre-cooking, I would believe them. They’ve never steered me wrong. Could you substitute cashew butter for raw cashews and if so when would you recommend incorporating? Yes, you would add it in Step 3, in the food processor. The only reason I didn’t include it as a substitute is that it’s much more expensive and it calls for a lot of cashews. This is so yummy! I also purschased the cookbook recently and I didn’t have very high hopes for this lasagna. I’m gluten free, so I made some noddles from zucchini with a ribbon slicer attachment for my kitchen aide, but that was the only major change I made. I loved the texture of the cashew and cauliflower “cheese”, it really had a ricotta like texture. We are working toward a more plant based household, and even my bf (a dedicated carnivore) said “it tastes like lasagna but it probably won’t my my stomach hurt” I think we have a new plant based staple dish! Thank you for sharing!! Believe me, I didn’t have high hopes for this lasagna either, but wow! We are all obsessed! I have tried it with GF lasagne noodles and it turned out great! 2. Shredded Almond cheese from trader joe Can it be added to same dish? Gosh, I haven’t tried doing either. I don’t see why you couldn’t add the almond cheese. I don’t think it’s totally dairy-free, if I’m not mistaken. Not sure about freezing. I should try to do it so everyone knows. For Gf lasagne noodles that are not no bake we should cook first? Yes. Noodles that do not say NO BOIL should be boiled first. Follow the package directions for time. OMG! Made it last night and just had some left overs. So delicious! I did notice the Jovial GF lasagne said it could be used as no bake or par cooked 4 min. I went with the latter but good to know. Have you ever tried freezing any left overs of this? Isn’t it delish??? I have not tried freezing it, but I imagine it would freeze well. Hi! If allergic to eggplant just up the other veggies? Looks so good! FYI Manini’s also makes a good GF lasagna noodle. Totally! Thanks for the tip about Manini’s. Haven’t seen that brand around here, but go for East Coasters to know! Looks amazing! What GF option(s) would you rec? Thank you. 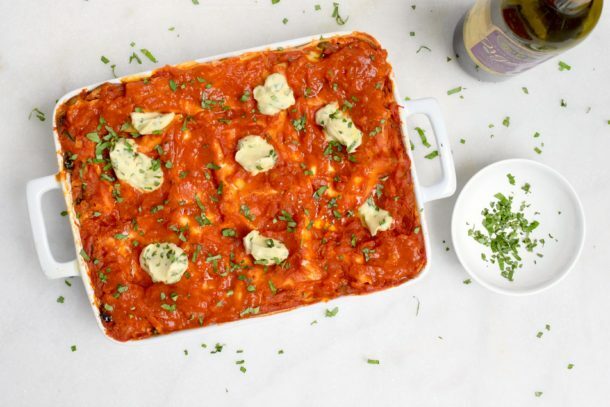 Try Tinkyada which is a brown-rice lasagne or Cappello’s for grain-free sheets.